Rhode Island State Police "5K Foot Pursuit"
"15:04 by Matt Pelletier in 2008"
Adam Malek set another 5K PR at the Jesse Owens Track Classic. Ben Strain chased down a Gorilla for the win in Ipswich and Kevin Tilton outpaced teammate Tim Van Orden at the Merrimack River 10 mile trail race. Lastly, Nate Jenkins held his own at the BAA 5K. Most of the CMS activity was in the Live Free or Die state of New Hampshire highlighted by overall wins from Jim Johnson in the Great Bay Half Marathon and Chris Mahoney at the SEA 5K. Nate Jenkins ripped a 9:02.77 two mile time just behind Ruben Sanca. 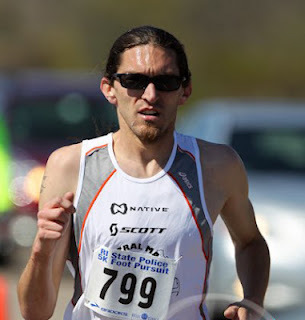 Greg Hammett showed that his trail legs are strong at the tough, winning the Northern Nipmuck Trail Race in Connecticut. CMS was again, competing all over New England over the weekend. Patrick Rich picked up the win in Salisbury while Nate Jenkins cleaned up in Andover. Kevin Tilton, Tim Mahoney, and Dan Vassallo pick up top 3 finishes as well.